If the TELESAR V ever becomes commercialized, long-distance relationships will probably stop being such a pain. 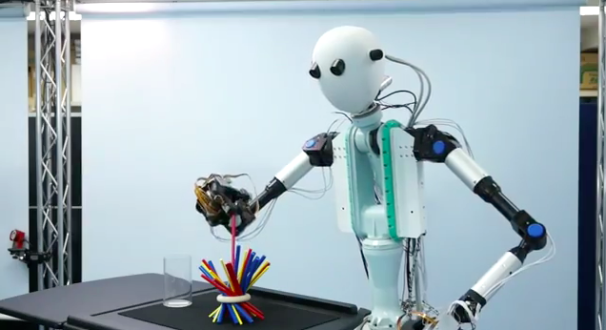 The latest telepresence system from the Japanese Science And Technology Agency (JST) and Keio University's Tachi Lab, the TELESAR V is the first of its kind in the world to allow its human operator to tell what kind of material being handled by their robot minion by touch alone. Of course, that was back in November 2011. Things have become even better now. The technology that powers the TELESAR V is something that sounds like it came straight from Bladerunner. According to Plastic Pals, there's a whole bunch of sensors in the hands and fingers of the TELESAR V that capture and relay tactile information to its operator. "The primary sensor inside each fingertip is a vision-based force sensor which is comprised of a wide-angle camera that looks through a gel-layer mixed with thermochromic ink. When the gel compresses, the thermochromic ink becomes denser, which the camera interprets as force information." We're not exactly sure what that means, either. However, we do know that there are microphones under the robot's fingertips capable of registering low- to mid-level vibrations and "thermoelectric peltier devices" capable of reproducing warm and cold temperatures. It looks like there's still a fair bit of work to be done before they can make the TELESAR V as sensitive as the real thing. And, as awesome as the idea of being able to help people work in hazardous environments might be, we all know that someone out there will find some unexpected uses for this sort of thing.